This blog is about writing, but it is really about my fiction writing. My predominant focus is on Fantasy, though I love science fiction too, and have also wrote a Indian-American women's fiction. Fantasy is at the moment my prime focus, and it's what I intend to focus on. But one thing I've also always loved is journaling, and I wrote about my journaling experiments and passion on my Journal Addict blog. Now, I am taking that to the next level and actually focusing on creative non-fiction writing, instead of causal blogging. That is going to be on my brand new platform, Kaizen Journaling, which goes live on Tuesday. Do you remember those days in school or college when you had to spend English classes pouring over fantastic work and ripping it apart? Wondering whether the author was depressed just because he happened to mention grey skies or feeling blue? That's not the kind of critiquing I mean. We'll leave that to the teachers and professors. I mean a helpful critique of a fellow author's work. Looking at their book to help them see things they might have missed after the fiftieth edit. If you are a writer, you know what I'm talking about. We've all been there, and found that words blurred into mere black smudges on paper. I haven't done a lot of critiquing for other people's book, possibly because I only have one critique partner. More because of lack of time than anything else. But even from my limited experience, I think it's a valuable thing. I guess it's human nature that it's a lot easier to spot mistakes or faults in other people's work than your own. Then there is the matter of outside perspective as well. When it's my story, I know it's inside out, so even a little hint makes the whole scene clear. But when it's someone else's vision, I don't know what it means, and so I need clear words and story line to be able to understand it. Critiquing someone else's work helps you think about issues in your own work. Or at least that's how it is for me. If I say to my CP, "too passive", and a day later I find myself writing a passive sentence, I notice it. If I complain that her character is "too whiny", I notice when mine is winging for no good reason. What we offer to our critique partners (hopefully) is constructive feedback, and that feedback is constructive for both parties because the more effort and thought you put into reviewing their work, means the more knowledge and skill you build up to edit your own. What do you think? Do you feel that your experience with your CPs is mutually beneficial? Does it improve your critiquing skills for your own work? 5. Book(s) you’ve pretended to read: Ooh, good question, but I don't dare tell. 6. Book(s) you’ve bought for the cover: Amaryllis in Blueberry by Christina Meldrum has one of the prettiest covers I've ever seen. 7. Book you’re a champion for: Definitely the books I mentioned as favorites--The Time Traveler's Wife and The Night Circus--along with The Curious Incident of the Dog in the Nighttime by Mark Haddon. I also talk about Juliet Marillier's Daughter of the Forest quite a bit, and with good reason; it's a beautifully written story. 8. Book that changed your life: The only book that changed my life, but that did truly change my life, is my novel, The Last Will of Moira Leahy. I worked on the story for six years, and wrote it twice, before it was published. 9. Book you most want to read again for the first time: All of my favorites, and I'll also include the Harry Potter series. 10. Book you turn to for comfort: Any of Barbara O'Neal's novels. Do you wish you could find the strength to be who you are, regardless of what the world (or your mom, spouse, children) want you to be? Do you want to have courage to live by your own rules, whether or not it conforms with what you "should" do? Do you want to be the best you can be, and change the world one page a time? If you said "yes" to any of the above, I could use your help. I'm working on a new, super-exciting project, and I am trying to gauge what would my readers find most useful. If you didn't answer "yes" to any of the above questions but know others who might, then please share. Thank you in advance, from the bottom of my heart!! And even if you don't want to participate, thank you for being my reader :-) I appreciate you being here. I’ve been doing a series of books from childhood on my blog, and there are many. Though one of my favourite authors as a child was Enid Blyton. I loved her Famous Five books. I have read so many fantastic books, I really can’t pick an all-time favourite book. Everything by all the authors listed below is in my list of ‘best books ever’. Stephen King, Sara Paretsky, Jim Butcher, Kathy Reichs, Mike Carey. 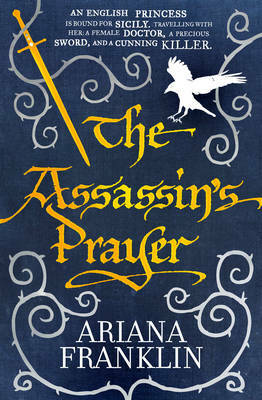 THE ASSASSIN’S PRAYER by Ariana Franklin. I’ve really been enjoying this series about a female Sicilian doctor who finds herself in unenlightened England during Henry II’s reign, where women doctors are unheard of and women with any kind of healing skill are considered to be witches. I love books about strong women, and this series is about a strong woman in a time when women really had no rights at all. Sadly, Ariana Franklin died last year, so there will be no more books in this series, which is a tragic loss to the literary world. I haven’t. My reading tastes are very straightforward, and I’ve never pretended otherwise. There are a lot of classics I haven’t read, nor never will. I don’t buy books solely for the cover. I’ll read the blurb, and maybe the first couple of paragraphs first, before I make a decision. AND THEN THERE WERE NONE, by Agatha Christie. Still the most perfect whodunit ever written. BURN MARKS by Sara Paretsky. The first book of hers that I read, it introduced me to V.I. Warshawski, who remains a shining example of a tough, intelligent, strong-minded woman, and she inspired me to want to write about a similar strong-minded woman, which is the moment my actress amateur sleuth was conceived. DISSOLUTION by CJ Sansom. This is the first book in an amazing series featuring the hunchback lawyer Matthew Shardlake, against the backdrop of Henry VIII’s ever-changing wives. Shardlake is an intelligent and sensitive protagonist, with the education to make a comfortable life for himself, whilst reconciling himself to the fact that his deformity means he will always be ridiculed and shunned, and that he will likely never find someone to share his life with. The politics of the era are blended cleverly with some murder mystery Matthew is trying to get to the bottom of. I will read these books again, because the wonderful writing makes them a joy to read, but it would be fabulous to do so again with the foreknowledge of ‘whodunnit’. Douglas Adams’s HITCHHIKERS GUIDE TO THE GALAXY. It always makes me laugh out loud. No one line springs to mind, but I love Jim Butcher’s books about his Chicago wizard Harry Dresden, because they are full of snappy one-liners. Harry is forever getting into trouble for them, but they are wonderful to read. My first love was a book of fairy tales in y grandmother's house. It was written in old German font and beautifully illustrated. Unfortunately it got lost or somebody else grabbed it when my grandmother died. I should remember to keep an eye open at flea markets and antique book shops! As young girl then I was obsessed by the Hanni & Nanni series written by Enid Blyton. It's rather difficult to chose one under your children, isn't it? *sigh* But if I really have to it would be The Black Dagger Brotherhood series by J.R. Ward. I've recently read the whole series again, just because of the German release of the latest book. Of course, I've already read the English version, I can't wait such long! In no particular order: J.R. Ward, Alexandre Dumas, J.K. Rowling, J.R.R. Tolkien, Stephen King ... can I really just name five?!? I've just opened the door to Cornelia Funke's Inkheart series ... where I always ask myself to which book I literally want to find a door to get in there in person. My first impulse was to say 'None! ', but then just the other day I saw an announcement for an upcoming movie ... to my shame and as passionate lover of Lord Of The Rings (both, book and movie), I have to admit, that I've never read The Hobbit - I only know the audio book. That doesn't count as read, right? Again I'd love to say 'None!' ... but that's only half of the truth. I fancy books that look good in my book shelves. 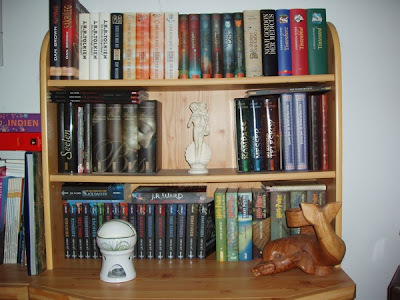 That for I've bought many of my favorites a second time, when a beautiful box set or special edition was released, e.g. Dan Brown's special illustrated edition of Angels & Demons and The DaVinci Code or the box set of His Dark Materials by Philip Pullman. · The Stand by Stephen King: Published in 1978, the possibility, that fiction becomes reality has never been more current and frightening. · The Count Of Monte Christo by Alexandre Dumas: No other book has ever portrait revenge in such a complex manner. · The Twilight Saga by Stephenie Meyer: A series, that satisfies the desire of my teenage-girl-heart. · The Perfume by Patrick Sueskind: The world of smells preserved between pages. Wonderful. · The Silent Miaow by Paul Gallico, Felidae by Akif Pirincci, Warrior Cats series by Erin Hunter: Must-reads for every cat owner. · Anne Franks Diary: A simple must read. · Die Goldhaendlerin (The Gold Merchant) & Die Wanderhure (The Wandering Whore) by Iny Lorentz: Strong heroines conquer their way in the Middle Ages. · Pride & Prejudice by Jane Austen: In that particular case, I'm not sure, if I like the book or the movie (the version with Keira Kneightley) more? · I'm Off Then: My Journey Along the Camino de Santiago by Hape Kerkeling: Funny, entertaining and 'a cognition of the day' at the end of every chapter. · The Physician by Noah Gordon & The Pillars of the Earth by Ken Follett: The Middle Ages have never been described more colorful and alive and thrilling. · The Lord of the Rings by J.R.R. Tolkien: What else should I say than 'One book to rule them all'! · Ramses series by Christian Jacq: Satisfies my desire for ancient Egypt. · Harry Potter series by J.K. Rowling: With every new release I admired her immense imagination and her ability to lay out secret hints more and more. · The Black Dagger Brotherhood series by J.R. Ward: Vampire warrior have never been sexier. I wouldn't say changed ... I mean, it's quite a big impact for such a small word. But there's a book that made me think a lot, about life, fate and coincidence, possibilities and lost chances, me and my personality: The Alchemist by Paulo Coelho. Unbelievable, but true, there are a few books in my shelves, I have read only once and they just wait for another turn: Ulldart series by Markus Heitz, The Millennium Trilogy by Stieg Larsson and The Swarm by Frank Schaetzing. Actually, there's no particular book. When I feel for a special book, I read it! I'm not sure, if it's from the book or the movie, anyway it's from Lord Of The Rings, J.R.R. Tolkien. Find more about my thoughts on reading, writing and Art Journaling over at my blog Nofretiris Dream Of Writing.